CLICK HERE TO RENT A BOAT! This year’s event constitutes once again a special edition, because it is dedicated to the memory of Gian Antonio Romanini, founder of “D’Inverno sul Po”. 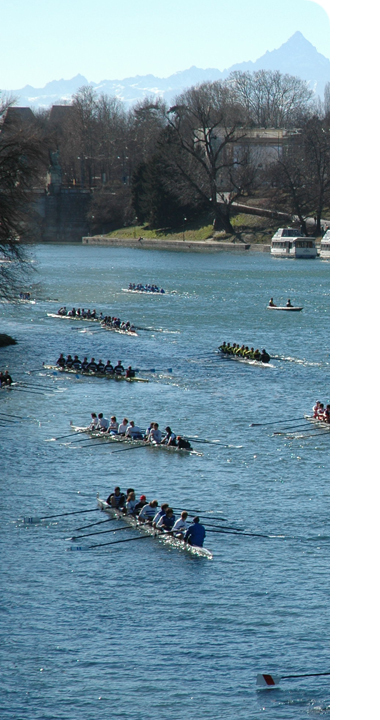 Since 1983, Società Canottieri Esperia-Torino continues its traditional International long-distance rowing regatta entitled "D’inverno sul Po" for boats 1x, 2x, 2x mixed, 2-, 4x mixed and 8+ mixed (4 men and 4 women) on Saturday, and 4x and 8+ on Sunday. All athletes, women and men, from the following categories can participate: Novice B1 and B2 (1000 m.), Novice C (13 years old), Cadets (14 years old), Young (15-16 years old), Junior (17-18 years old), Senior (over 18 years old), Master (over 27 years old, all categories) and Pararowing. In 2018, approximately 2800 athletes from more than 120 rowing clubs, took part in the competition, of which 22 came from France, Switzerland, Germany, the U.K., Romania, Hungary, The Netherlands, Greece and Algeria, as well as from all Italy. In the past years, the Po river also hosted rowers from Argentina, Portugal, Spain, Belgium, Turkey, Norway Lithuania and Ukraine.